Discover the fantastic worlds of the DC Universe in this exciting sourcebook. For the first time anywhere, the Atlas of the DC Universe presents a complete guide to the people, organizations, and most importantly, the places that make up the exciting world of DC Comics. 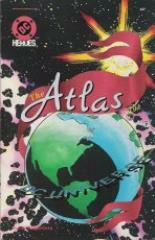 The Atlas provides you with maps and background on cities of the United States, countries of the Earth, planets of the galaxy, and the dimensions that make up the multiverse.